=> Sign it, thank you! The foresight research process called Millennia2015 Women actors of development for the global challenges, created in 2007, led to the Action Plan for Women's Empowerment sketched with the patronage of UNESCO at the International Conference, 3-4 in December 2012 in Paris, and constantly strengthened by field partners. Six strategic axes, designed to meet the macro-issues and to reach the vision of Millennia2015 formulated by the Millennia2015 Voluntary Researchers' Network by 2025, are implemented through the concrete actions proposed by the network. The objective of the Millennia2025 Women and Innovation Foundation is to achieve these concrete actions and action plans in favor of women and girls in the concerned countries, for their empowerment and for gender equality. Gender equality benefits everyone, not just women. It is an accelerator of political, economic and social transformations, which boosts the strength. Ms Irina Bokova, Director General of UNESCO, Inaugural lecture, International conference Millennia2025 "An action plan for women's empowerment, Paris, UNESCO, 03.12.2012. ∨ MDG 8. To develop a global partnership for development. The project management will be coordinated with the suppliers participating in the project. Independently of the Millennia2025 Foundation, companies will reduce costs for women that have been identified as living in precarious situation. The financing of the action will be possible thanks to the contributions and generosity of the companies' clients who act in solidarity with women in precarious situations. The personal data of those persons will remain confidential in the company database. No financial transaction will be done between the suppliers and the Millennia2025 Foundation. Sponsors and financial partners who agree to finance a part of Millennia2025 Solidarity-Women (research and implementation) will be valued in all the promotion and implementation tools of the concrete action on the long run, while benefiting of the quality label and added value of the action. research centers, universities, NGOs and researchers: contact us and welcome! 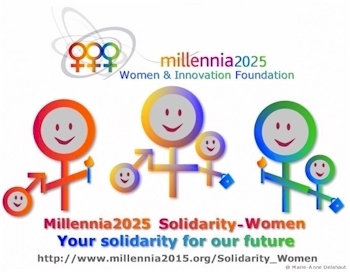 => Offer a gift to Millennia2025 Solidarity-Women! Thank you! => Register as member of Millennia2015! We thank you for your collaboration!